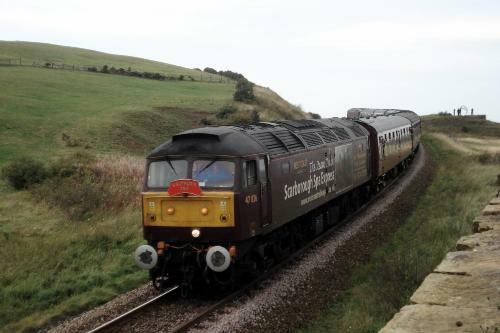 (1) Was booked for steam haulage (loco 48151), but this was switched to diesel traction due to a steam ban on the ECML. (4) Was booked to reverse at Stockton so that 48151 could lead, but reversal was deemed unnecessary after the switch to diesel. Thornaby 10/38 10/33 ? ? Saltburn 14.29d ? 17.53a ? Redcar Central 14/37 ? 17/41 ? Grangetown Jn 14.42 ~ 14.50 ? 17.26 ~ 17.34 ? Redcar Central 14/55 ? 17/21 ? Crag Hall 15.33 ~ 15.35 ? 16.43 ~ 16.45 ? Boulby 16.05 ? 16.13 ?